Thanks to Lori at Pure Imagination, Angel at Reading Angel, and Candace at Candace's Book Blog, we have another fun hop to participate in. There are tons of great book related giveaways up for grabs all week! The Linky for all participants is at the end of the post. Hop away! 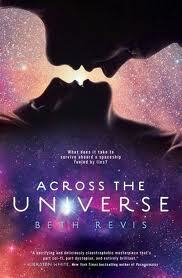 Because I can't add correctly and Beth Revis was SO generous, I have some extra Across the Universe swag up for grabs! What's Across the Universe? Only one of the BEST books I've read recently. The cover art will take you to the Goodreads page. One lucky winner will win a SIGNED bookplate, a SIGNED postcard, a SIGNED bookmark, and a pack of buttons!